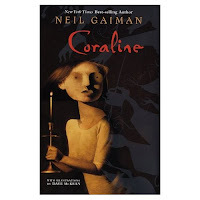 A couple of years ago, I read and reviewed Coraline. I won't re-review it here but you can go see what I thought of it then. I gave that copy to the school library but this past Christmas thought it was time to share it with my daughter. We must have watched the movie version 100 times. I really liked the empowering message of the book, especially the idea of doing something that must be done even though you are afraid. My daughter has been having issues lately involving worrying about things she has no control over. I myself am a worrier so I understand where she's coming from but I don't want it to affect her life. At one point in the story, Coraline tells the cat a story about her Dad and a wasps' nest. She finishes by saying, "when you're scared but still do it anyway, that's brave." This is something I've been reminding my daughter since we read that part. We read it a chapter at a time at bedtime. There were lots of interruptions of "that wasn't in the movie" or "I remember that from the movie." She also noticed how descriptive the book was. One of the things I hate about the novelizations of movies my girl likes to get from school is how they just describe the film word for word. It's so boring. I pointed out to her the difference here. She really enjoyed Coraline. When I asked her what she liked better the movie or the book, she said, "Hmm, I like them both!"